New York Rangers President and General Manager Glen Sather announced today that the club has agreed to terms with unrestricted free agent forward Derek Boogaard. Boogaard, 28, appeared in 57 games with the Minnesota Wild last season, registering four assists and a team-high 105 penalty minutes. 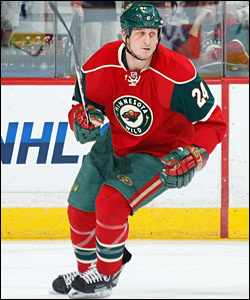 Boogaard led the Wild with nine fighting majors, and ranked eighth on the team with 83 hits. At 6-foot-7 and 260 pounds, Derek Boogaard has been one of the NHL's most feared enforcers since entering the league with Minnesota in 2005-06. Minnesota posted a record of 29-22-6 when he was in the lineup, and were 4-0-0 in games that Boogaard registered a point. Boogaard eclipsed the 500 career penalty minute mark with 11 penalty minutes on January 13 vs. Vancouver. He also logged a career-high, 11:58 of icetime and a team-high, five hits, on December 19 at Ottawa. In 2008-09, Boogaard led the Wild with 87 penalty minutes, tied for fourth on the team with a plus-three rating and ranked seventh on the team with 62 hits. Boogaard tallied three assists while skating in 51 games. The Wild posted a record of 2-0-1 when he registered a point. Boogaard recorded two assists in a three-game span from October 16 at Florida to October 23 vs. Buffalo. The 6-7, 260-pounder has skated in 255 career regular season contests over five seasons with the Minnesota Wild, registering two goals and 12 assists for 14 points, along with 544 penalty minutes. Boogaard led Minnesota in penalty minutes in four of his five NHL seasons, and ranks second in Wild franchise history with 544 career penalty minutes. He established career-highs in games played (65), goals (two), points (six) and penalty minutes (158) as a rookie in 2005-06. His 158 penalty minutes also marked a Wild franchise rookie record, and ranked 11th in the NHL and first among league rookies. He made his NHL debut on October 5, 2005 vs. Calgary, and registered two points (one goal and one assist) through his first five NHL games. Boogaard tallied his first NHL point with an assist on October 14, 2005 vs. Vancouver, and notched his first career point with the game-winning goal on October 19, 2005 vs. San Jose. In addition, Boogaard has registered one assist and 44 penalty minutes in 10 career post-season contests with Minnesota.